We promised you an early look at the upcoming Costco October 2018 Coupon Book and here it is. 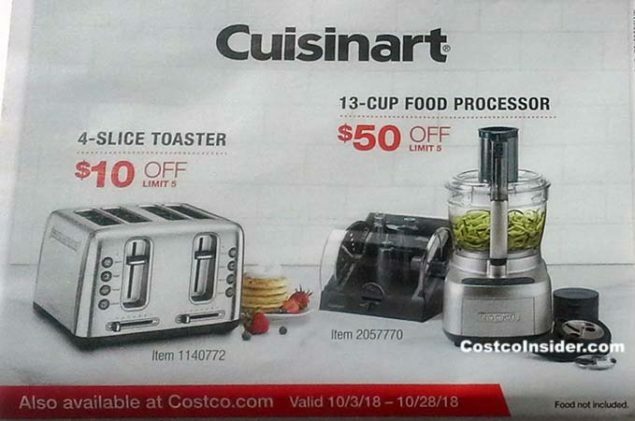 The October 2018 Costco coupons run from October 3rd through October 28th. The September 2018 Coupon Book runs until September 30th, so there is once again only a 3 day gap between Costco coupon books. If you want to see a list of all the upcoming coupon books make sure to take a look at our Upcoming October 2018 Coupon Book post (did you know the November Costco coupon book also starts in October?!) This is an average size coupon book at 23 pages. If you want to get an email as soon as we post the latest coupons you can sign up for our email list, or Like us on Facebook! As we previously mentioned, one deal that stands out is the Refresh Skin Therapy Fruit Acid 15% Gel Peel at $10 off. At a price of only $14.99 after coupon that makes it an extreme value when compared to other popular brands acid gel peels which can run as much as $80 – $120. Taking the Costco return policy into account and the 4.4 rating on Costco.com it’s definitely worth giving it a try. We’ve also been happy with our purchases of the Winix Air Purifier ($99 after coupon). One brand new Costco item we might have to try is the Shine Organics Variety Pack, which are squeezable baby food pouches with healthy ingredients in them. The tire deal is Michelin again but this month it includes an extra $60 off if using the Costco Visa in addition to the usual $70 off. We have to say, we are happier with this coupon book than the last few months. Do you agree or no?